Pour the liquid over the bread chunks and press down gently with a spoon to be sure all the cubes are getting a good coating. Soften the butter for 30 seconds in the microwave. Place the brown sugar, walnuts and softened butter into a Ziploc bag, close and squish to mix well. 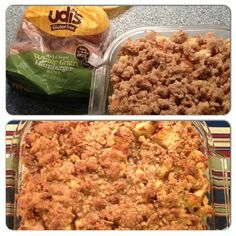 Cover the casserole with saran, place the Ziploc bag on top, and put in the refrigerator to set overnight. In the morning, preheat the oven to 350 degrees, remove the saran, crumble the sugar mixture on top and bake for 50-55 minutes. Serve with syrup.